The What: Atlona has begun shipping the AT-HDVS-SC-RX HDBaseT receiver and 4K/UHD scaler with a local HDMI input. The What Else: The AT-HDVS-SC-RX receives HDBaseT for video output up to 4K30 4:4:4, plus embedded audio, control, and Ethernet over distances up to 330 feet (100 meters). The HDVS-SC-RX features Atlona CrystalScale technology with high-quality downscaling and upscaling, as well as advanced image optimization capabilities plus internal test patterns for setup and troubleshooting. The Bottom Line: For complete integration for meeting rooms, the HDVS-SC-RX and an HDVS-200 or Omega Series transmitter together provide a compact yet integrated solution with automatic input selection, HDBaseT extension, display control capabilities, room control, audio de-embedding, and volume control. 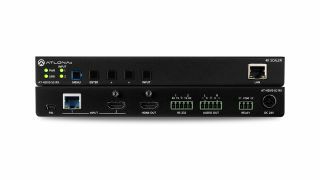 For larger presentation applications, the HDVS-SC-RX is well suited for extending AV connectivity from an Atlona HDBaseT-equipped switcher to a remote display or projector. Content can be upscaled, downscaled, or delivered with scaling bypassed, while providing high-quality imagery.